Our Dalek was constructed in the early summer of 2005 following the screening of the new series of Dr Who by the BBC. In episode 6, 30th April 2005, the Dalek's re-appeared after some 17 years away from the screen. It was my sons idea to build the Dalek, who said to me after seeing episode 6 on television for the first time "It would be cool to have one of those". In the following weeks I spent time playing with the design extending to a cardboard space frame, eventually I found the Dalek plans on the web. If it was not for these then the Dalek would have never happened. 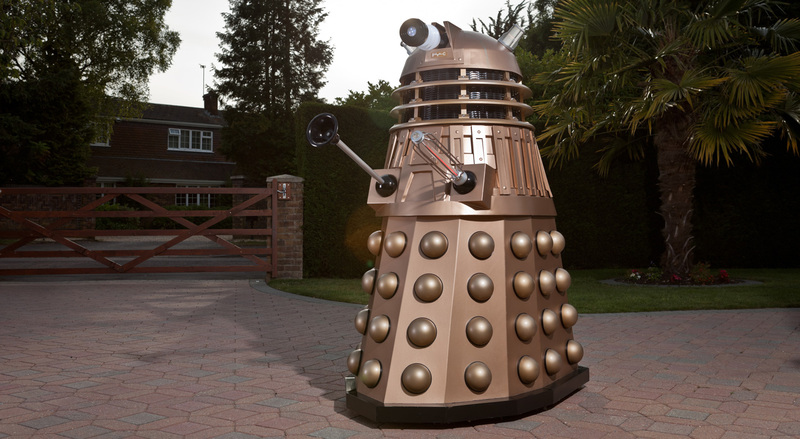 The Dalek is constructed of plywood for the structure, flexible plastic for the skins and a fibreglass dome. 2 windscreen wiper motors provide the power from 12 volt batteries. And of course no Dalek is complete without the obligatory sink plunger. After 8 weeks of intense construction the Dalek was nearly complete and ready for its first public showing at a local school which my son attended. Whilst it was not originally conceived as a charity icon, the publics reaction showed that it had the opportunity to cause that "wow" factor. Many members of the public have commented on how 'life like' the Dalek is. In addition, the Dalek is remote controlled by means of 2 electric motors and is also able to play the Dr Who theme music with a customised Dalek voice-over. In the years that followed we raised over £6000 for local charities. However, due to changes in circumstances we no longer own Charity Dalek, but she is continuing her role in frightning young and old carbon based units and raising funds for charities.